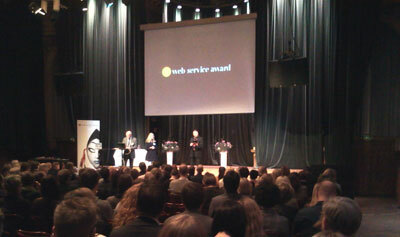 Each year Web Service Award surveys Swedish web responsibles and web managers their opinion about the quality of their web sites and working environment as well as how they are intending to develop them. 570 Swedish web managers were surveyed during January of this year for the 2012 trend report including representatives from companies, public services, councils, and other organisations. 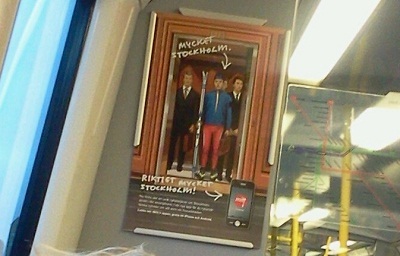 The proportion of each type of organisation (and indeed size) is not representative of Sweden as a whole. Large companies and organisations are hugely over-represented (76% of those surveyed, whilst only 0.56% of the total in Sweden), and smaller companies are massively under-represented (24% of survey, but 76% in Sweden as a whole). So some care has to be taken with the figures. This survey gives us an insight into what web managers think and how they feel about the world of web they work with. It’s not a survey of the visitors of websites, neither is it a survey of management or, ultimately, decision makers. The report (in Swedish) is a whopping 98 pages. There’s a huge amount of data in there. I’m just going to write about a few points which I feel deserve highlighting. Almost half of respondents said that they will be increasing their digital investments in 2012 compared to 2011. It would appear that a good chunk of that money is going to go into developing mobile solutions. 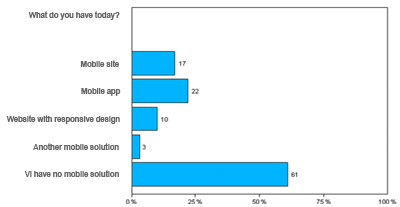 42% said that they are planning to produce a mobile ready version of their website, and 21% said they were planning a mobile app during 2012. 61% said that they didn’t currently have any form of mobile solution (neither app of mobile ready website), so if the web responsibles surveyed manage to achieve what they’ve planned then next year this figure should drop through the floor! 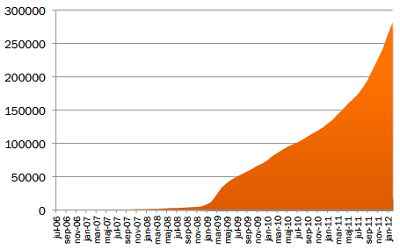 2012 is looking like the year of mobile development. Despite a constantly increasing amount of investment in digital channels, there hasn’t been a corresponding increase in internal resources that take care of them. I find it quite shocking that despite the importance of websites for organisations, and the money invested in (re)developing them, a staggering 50% of respondents only work half-time with their sites. Only 23% at most are dedicated web managers working full time with their sites. Only 32% say that they have enough resources to manage their website’s content. Given that almost half of the organisations surveyed are large organisations with over 500 employees (44%), the low number of dedicated web responsibles cannot be explained solely by a corresponding percentage of SME sites where it is would be more expected that a person has multiple roles. 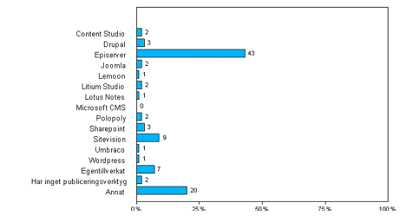 Amongst the sites in the survey, EpiServer dominates overwhelmingly as the CMS of choice for the larger organisations (over 50 employees) with 50% using the Swedish platform to server up their websites. It’s a different picture amongst the smaller organisations surveyed (less than 50 employees). Here we see EpiServer’s being used as the publishing tool for 22% of surveyed websites. 36% responded with “other”, which presumably includes an array of CMS tools created by smaller companies. I’m surprised that WordPress didn’t feature higher amongst smaller companies. My experience is that it’s pretty much the default CMS choice for this size of company, but only 1% across the entire survey irrespective of organisation size (which is presumably just 5 respondents) said that WordPress powered their website. Generally speaking most stats in the report point to positive developments with websites and how they are managed. One of the exceptions is the lack of (dedicated) resources to run, maintain and develop the web and digital presence of an organisation. We’re learning and moving forward as web managers and web professionals, but It’s still early days, and I think many of the answers show that. I thought I’d have a bit of fun and make a video of myself following the instructions in the advert. My initial reaction when I saw the ad was: this is a very long winded way of getting readers to view a promotional video. My video clip is 9 minutes long, and apart from some chat at the beginning, it took pretty much that long to get to IMD’s video clip. Many people are complaining about QR codes being pointless. When implemented correctly and in a context where it helps, they can add value. Unfortunately time after time they are badly implemented and just become an obstacle. 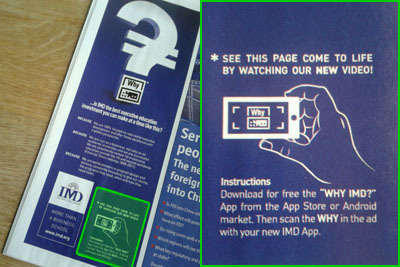 This “see the page come alive” stunt by IMD is worse than a poorly implemented QR code. I say it is worse as you need to use a specific app for this specific ad. a 14MB monster of an app that requires (at least on Android) a whole load of permissions well beyond what it needs for its simple functionality. When running campaigns that involve scanning or “reading” content, then you should always print a (simple to type) URL in the ad. This makes the content accessible to the reader/viewer even if, for whatever reason, scanning isn’t possible or doesn’t work. Perhaps I’m being mean, and under-estimating the time and enthusiasm for such gimmicks that Economist readers interested in executive education programs have. Judging by the 10-50 downloads on the app’s page in Google Play, I’ve got a feeling I’m not under-estimating at all. What do you think? Money well spent, or ill conceived gimmick? I think pretty much everyone has an opinion about how the news industry should adapt in order to survive in the digital age. Even I’ve turned out a few blog posts on the subject. Local newspaper company Mitt i Stockholm publishes 31 newspapers here in the Greater Stockholm area and they have a rather peculiar puzzling terrible digital strategy which manages to minimise the user experience for a huge section of their target audience. In this blog post I’ll walk you through a few parts of their digital presence and highlight some of the problems. I’ll also, in the spirit of free local newspapers, offer Mitt i some free advice. I don’t think they thought things through from a reader perspective at all. I’m also not convinced that this idea has been built on clear business goals either. The adverts on the Metro system, and the full page adverts in all the editions of the printed newspaper give very little information. 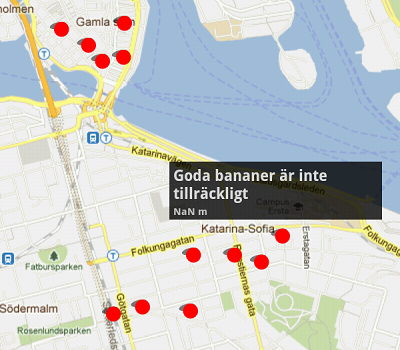 The app for iPhone and Android (but not iPad) claims to deliver a “unique news service about Stockholm” but fails to give any specific details. Searching for “mitt i” and installing the app was pretty painless. Although reading the poor reviews didn’t give me high expectations. On Android it would appear the app didn’t work at all with the latest version of the operating system, Ice Cream Sandwich. It worked for me, usually. It did though crash and close itself on a number of occasions. Everything needs to be tested and tested well. Use vistor data from your web site to help prioritise the devices and platforms you test. Make sure you keep an eye on reviews and comments to your newly launched app and make sure you’re ready to fix any bugs and quickly release an updated version. Given that Mitt i is produced in 31 local variations, it was immediately puzzling that the app lacked any way of choosing my edition. You see news articles from all 31 editions of the newspaper. It may be harsh, but I don’t want local news from Lidingö, I want it from Enskede. An article in the app comprises of a picture, a headline and body text. The only additional feature are buttons to increase and decrease the text size and next/previous article buttons. There are no links, and most significantly, no ability to share the article whatsoever. The article is totally locked within the app. There’s no way of recommending it, or passing it on to a friend. Not even the familiar Android “share” menu appears. There’s no way an article could become viral, or be used in order to acquire more readers for the newspaper. Make sure your content can be easily shared. Make use of standard share functions. Test sharing your content on relevant social networks to make sure it displays as you’d expect. One of the features (not mentioned in the marketing for the app) is their restaurant guide with map and (editorial) reviews. There is, of course, no possibility to add your own comment or rating, or even to add a new review. Hardly a unique selling point for the app. Much better similar services exist. If the restaurant reviews are strategically important and must be included in the app, then why not enhance them with information and content from other services, such as Allakartor. Allakartor makes its data available via an API, making it relatively straight forward to include. The lack of any sharing in the app starts to become a little more understandable (but no more forgivable!) when you take a look at the Mitt i website. The content from the various newspapers is only available as e-zines. That is to say, a flash or image-based presentation of the content built from a PDF version of the newspaper. It’s difficult to make content any less accessible then is achieved by publishing it in this way. Viewing this type of e-zine on tablets or mobile devices is hopeless. It also not very search engine friendly – and by that I mean not only unfriendly for Google but also for on-site search and the visitor. Searching the archive on Mitt i rarely gives a satisfactory result. In addition, no article has its own URL. You can’t share a link to a particular story. The best you can do is link to a whole page from the paper . This is something I managed to do, but I suspect not something very many typical readers would achieve. Avoid using ezine publications. They rarely deliver good user experiences. Make the PDF available as a download. Publish content in it’s own right on dedicated, shareable, pages. 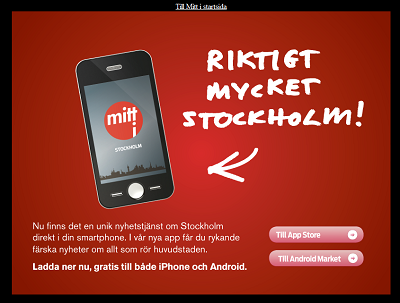 As part of the campaign to promote the app, Mitt i has moved their normal start page and replaced it with a splash page. Splash pages are known to irritate users. A certain percentage will leave immediately on seeing a splash page. Determined users will click on the “enter site” link as quick as possible in order to get on with the task they came to the site to complete. Trying to distracting visitors as soon as they arrive is rarely a good plan. The splash page itself is poorly constructed, with almost the entire content of the page contained in an image with no textual alternative. The links to the Android and Apple apps are made created using an image map, something that most of us avoid like the plague these days. If you do deploy a splash page (which I wouldn’t recommend) then place it on its own URL. Redirect your index page temporarily to your splash page with a http 302 temporary redirect code. You may also want to make it no index. Take care to code the page correctly, making it as accessible as possible. Splash pages are not only terrible for visitors, but also for search engines. Removing almost all the text-based content from a web page results in a very poor quality snippet. The title of Mitt i in Google at the moment is “Mitt i app” with a description of “to the mitt i homepage”. Hardly enticing. The Mitt i web site fails to follow even the most basic SEO advice such as unique page titles and quality meta descriptions. Mitt i search results take a further hit due to the amount of content only available as PDFs or as images. As mentioned earlier, none of the articles from the newspapers are available as specific web pages. Make sure articles are published as web pages with their own distinct URLs. Make sure page titles are descriptive, unique and contain relevant keywords. Make sure a well written meta description is included on every single page. There is demand and interest for local news, and thousands of people take the time to read the paper editions of Mitt i. It’s frustrating how poor the digital strategy is for this local newspaper – they have the content, it just needs to be better utilised. Rival free local newspaper company Direct Press does a much better job with their web presence. It’s not perfect, but at least the content from their publications is available online in a way which is accessible, shareable and findable. It’s important to think holistically. Consider how every thing you do (both online and offline) fits together; how it is seen, consumed and interacted with by your customers (readers, members, supporters, or whatever you’d like to label them as). With the revenue obtained from advertising in (printed) free local papers such as Mitt i in terminal decline, minimising the user experience of their readers is hardly a strategy that will help them innovate and survive. When managing a website for a company or organisation one of the many discussion points between you and content owners is whether their content should be published or not. I’ve produced a Go/No-go website content template to help guide you in that decision making process. You’ve done the ground-work. You know your digital strategy, content strategy, SEO strategy. You’ve pinned down your business goals and worked out the ways in which your visitors are going to convert. After all that time, effort and investment, the last thing you need is a piece of content hitting you broadside from a content or product owner that lacks the thought and consideration as to how publishing it will positively add to your website and help it meet its goals. This template is designed to be used at the idea stage. The actual content, and where it fits into the website, is irrelevant at this point (and deserves a go/no-go template of its own!). By getting the content owner to consider each point on the template and provide details, you help them meet a standard set of requirements. It puts in place an open and clear way of showing your organisation what you, the manager of the website, requires of each (new) page. How is the goal to be measured? Good luck, and make sure you let me know if (and how) this template helps you. More templates will be published during the year – keep an eye out for them!